Fromm 犬用 無穀物三文魚鴨肉蔬菜配方 (Surf N Turf) 26磅 全新無穀物配方.高營養配方, 高運動量, 腸胃敏感或美毛首選. A grain-free blend of wild salmon, duck, chicken, hand-picked vegetables & fruits, eggs, and real Wisconsin cheeseIngredients Salmon, Duck Meal, Potatoes, Pea Flour, Sweet Potatoes, Duck, Chicken Fat, Dried Tomato Pomace, Salmon Meal, Dried Whole Egg, Pea Protein, Chicken , Flaxseed, Cheese, S..
Fromm 犬用 無穀物三文魚鴨肉蔬菜配方 (Surf N Turf) 4磅全新無穀物配方. 高營養配方, 高運動量, 腸胃敏感或美毛首選. 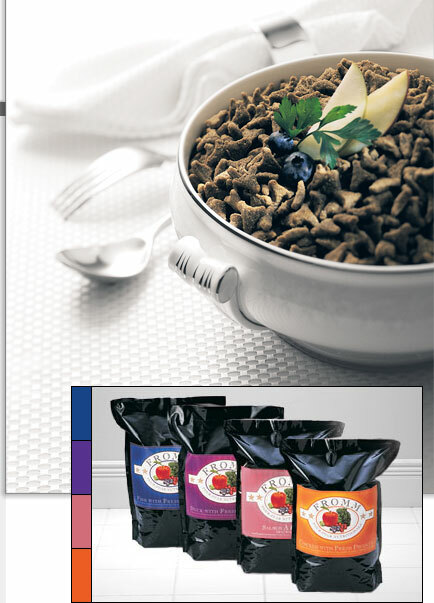 A grain-free blend of wild salmon, duck, chicken, hand-picked vegetables & fruits, eggs, and real Wisconsin cheeseIngredients Salmon, Duck Meal, Potatoes, Pea Flour, Sweet Potatoes, Duck, Chicken Fat, Dried Tomato Pomace, Salmon Meal, Dried Whole Egg, Pea Protein, Chicken , Flaxseed, Cheese, S..
Fromm 犬用 無穀物全家禽蔬菜配方 (Game Bird Recipe) 12磅全新無穀物配方. 高營養配方, 高運動量, 腸胃敏感或美毛首選. A grain-free entrée of duck, turkey, quail, and pheasant with farm-fresh fruits & vegetables .Ingredient Duck, Duck Meal, Peas, Turkey, Potatoes, Pea Protein, Dried Tomato Pomace, Pea Flour, Dried Whole Egg, Quail, Chicken Meal, Chicken Fat, Salmon Oil, Sweet Potatoes, Chicken, Pheasant, Cheese, Flaxs..
Fromm 犬用 無穀物全家禽蔬菜配方 (Game Bird Recipe) 26磅全新無穀物配方. 高營養配方, 高運動量, 腸胃敏感或美毛首選. A grain-free entrée of duck, turkey, quail, and pheasant with farm-fresh fruits & vegetables .Ingredient Duck, Duck Meal, Peas, Turkey, Potatoes, Pea Protein, Dried Tomato Pomace, Pea Flour, Dried Whole Egg, Quail, Chicken Meal, Chicken Fat, Salmon Oil, Sweet Potatoes, Chicken, Pheasant, Cheese, Flaxs..
Fromm 犬用 無穀物全家禽蔬菜配方 (Game Bird Recipe) 4磅全新無穀物配方. 高營養配方, 高運動量, 腸胃敏感或美毛首選. A grain-free entrée of duck, turkey, quail, and pheasant with farm-fresh fruits & vegetables .Ingredient Duck, Duck Meal, Peas, Turkey, Potatoes, Pea Protein, Dried Tomato Pomace, Pea Flour, Dried Whole Egg, Quail, Chicken Meal, Chicken Fat, Salmon Oil, Sweet Potatoes, Chicken, Pheasant, Cheese, Flaxse..
Fromm 犬用 無穀物全魚蔬菜配方 (Salmon Tunalin) 12磅 全新無穀物配方.高營養配方, 高運動量, 腸胃敏感或美毛首選. A grain-free recipe made with wild salmon and tuna with a medley of mediterranean garden vegetables. Ingredient Salmon,	Salmon Meal,	Peas,	Potatoes,	Pea Flour,Dried Tomato Pomace,	Tuna,	Dried Whole Egg,Sardine Meal, Anchovy Meal,	Chicken Liver,	Chicken Fat,	Salmon Oil, Flaxseed,	Cheese,	Monocalcium Ph..
Fromm 犬用 無穀物全魚蔬菜配方 (Salmon Tunalin) 26磅 全新無穀物配方.高營養配方, 高運動量, 腸胃敏感或美毛首選. A grain-free recipe made with wild salmon and tuna with a medley of mediterranean garden vegetables. Ingredient Salmon,	Salmon Meal,	Peas,	Potatoes,	Pea Flour,Dried Tomato Pomace,	Tuna,	Dried Whole Egg,Sardine Meal, Anchovy Meal,	Chicken Liver,	Chicken Fat,	Salmon Oil, Flaxseed,	Cheese,	Monocalcium Ph..
Fromm 犬用 無穀物全魚蔬菜配方 (Salmon Tunalin) 4磅 全新無穀物配方.高營養配方, 高運動量, 腸胃敏感或美毛首選. A grain-free recipe made with wild salmon and tuna with a medley of mediterranean garden vegetables. Ingredient Salmon,	Salmon Meal,	Peas,	Potatoes,	Pea Flour,Dried Tomato Pomace,	Tuna,	Dried Whole Egg,Sardine Meal, Anchovy Meal,	Chicken Liver,	Chicken Fat,	Salmon Oil, Flaxseed,	Cheese,	Monocalcium Pho..
避免動物缺糧，請預至少7工作天前訂購。Fromm 犬用 無穀物羊肉蔬菜配方 (Lamb Recipe) 12磅以羊肉作為主要肉類來源，能預防狗狗腸胃過敏。羊肉品質需要達到美國 USDA / APHIS 的準則，其安全檢驗系統能 確保品質安全和營養。羊肉其中含有豐富鐵、鋅等必要的營養素，對於免疫系統的維護及身體肌肉和骨骼健康發展的 能量來源。配方融合有豐富抗氧化成份的橄欖油，其單一不飽和脂肪酸及多種維生素，有助預防身體和細胞老化，亦 兼具護膚護髮功效。符合 AAFCO 的營養標準，選用人類食用質素的材料，不含人造色素、味精、防腐劑和動物副產品。*** 抗敏感或美毛首選 ***成份:羊肉，羊肉粉，小扁豆，鷹嘴豆，幹的全蛋，豌豆，幹番茄渣，肥豬肉，豌豆粉，豬肝，三文魚油，奶酪，橄欖油，黃色的南瓜，西葫蘆，蘋果，亞麻籽，豌豆纖維，西紅柿，胡蘿蔔，花椰菜，氯化鉀，鹽，菊苣根提取物，絲蘭提取物，亞硒酸..
避免動物缺糧，請預至少7工作天前訂購。Fromm 犬用 無穀物羊肉蔬菜配方 (Lamb Recipe) 26磅以羊肉作為主要肉類來源，能預防狗狗腸胃過敏。羊肉品質需要達到美國 USDA / APHIS 的準則，其安全檢驗系統能 確保品質安全和營養。羊肉其中含有豐富鐵、鋅等必要的營養素，對於免疫系統的維護及身體肌肉和骨骼健康發展的 能量來源。配方融合有豐富抗氧化成份的橄欖油，其單一不飽和脂肪酸及多種維生素，有助預防身體和細胞老化，亦 兼具護膚護髮功效。符合 AAFCO 的營養標準，選用人類食用質素的材料，不含人造色素、味精、防腐劑和動物副產品。*** 抗敏感或美毛首選 ***成份:羊肉，羊肉粉，小扁豆，鷹嘴豆，幹的全蛋，豌豆，幹番茄渣，肥豬肉，豌豆粉，豬肝，三文魚油，奶酪，橄欖油，黃色的南瓜，西葫蘆，蘋果，亞麻籽，豌豆纖維，西紅柿，胡蘿蔔，花椰菜，氯化鉀，鹽，菊苣根提取物，絲蘭提取物，亞硒酸..
避免動物缺糧，請預至少7工作天前訂購。Fromm 犬用 無穀物羊肉蔬菜配方 (Lamb Recipe) 4磅以羊肉作為主要肉類來源，能預防狗狗腸胃過敏。羊肉品質需要達到美國 USDA / APHIS 的準則，其安全檢驗系統能 確保品質安全和營養。羊肉其中含有豐富鐵、鋅等必要的營養素，對於免疫系統的維護及身體肌肉和骨骼健康發展的 能量來源。配方融合有豐富抗氧化成份的橄欖油，其單一不飽和脂肪酸及多種維生素，有助預防身體和細胞老化，亦 兼具護膚護髮功效。符合 AAFCO 的營養標準，選用人類食用質素的材料，不含人造色素、味精、防腐劑和動物副產品。*** 抗敏感或美毛首選 ***成份: 羊肉，羊肉粉，小扁豆，鷹嘴豆，幹的全蛋，豌豆，幹番茄渣，肥豬肉，豌豆粉，豬肝，三文魚油，奶酪，橄欖油，黃色的南瓜，西葫蘆，蘋果，亞麻籽，豌豆纖維，西紅柿，胡蘿蔔，花椰菜，氯化鉀，鹽，菊苣根提取物，絲蘭提取物，亞硒酸..
避免動物缺糧，請預至少7工作天前訂購。Fromm 犬用 無穀物鴨兔肉蔬菜配方 (Hasen Duck) 12磅兔肉比一般肉類的蛋白質含量高，而其脂肪、熱量和膽固醇比例相對於其他肉類低。還包含有多種礦物質，如鐵、磷 、鉀、鋅和維他命 B 和 C等。其脂肪多為不飽和脂肪酸，除可増強健體之餘也有利於控制體重。另嚴選多種新鮮蔬菜 及水果，令營養更均衡。配方融合多種益生菌，針對改善消化系統，減低狗狗腸胃敏感不適，增強免疫能力。另加亞 麻籽及新鮮提煉的三文魚油，令配方含有奧米加3及奧米加6脂肪酸，有助寵物保持皮膚健康，滋潤披毛，亦有效提升 免疫系統，預防疾病。 *** 抗敏感首選 ***成份: 兔肉，鴨肉，豬肉粉，豌豆，馬鈴薯，小扁豆，鷹嘴豆，豌豆粉，幹番茄渣，幹的全蛋，肥豬肉，兔肉飯，豬肝，豌豆蛋白，三文魚油，奶酪，亞麻籽，苜蓿粉，胡蘿蔔，芹菜，生菜，西洋菜，菠菜，氯化鉀，鹽，菊苣根提取物，絲蘭提取..
避免動物缺糧，請預至少7工作天前訂購。Fromm 犬用 無穀物鴨兔肉蔬菜配方 (Hasen Duck) 26磅兔肉比一般肉類的蛋白質含量高，而其脂肪、熱量和膽固醇比例相對於其他肉類低。還包含有多種礦物質，如鐵、磷 、鉀、鋅和維他命 B 和 C等。其脂肪多為不飽和脂肪酸，除可増強健體之餘也有利於控制體重。另嚴選多種新鮮蔬菜 及水果，令營養更均衡。配方融合多種益生菌，針對改善消化系統，減低狗狗腸胃敏感不適，增強免疫能力。另加亞 麻籽及新鮮提煉的三文魚油，令配方含有奧米加3及奧米加6脂肪酸，有助寵物保持皮膚健康，滋潤披毛，亦有效提升 免疫系統，預防疾病。 *** 抗敏感首選 ***成份: 兔肉，鴨肉，豬肉粉，豌豆，馬鈴薯，小扁豆，鷹嘴豆，豌豆粉，幹番茄渣，幹的全蛋，肥豬肉，兔肉飯，豬肝，豌豆蛋白，三文魚油，奶酪，亞麻籽，苜蓿粉，胡蘿蔔，芹菜，生菜，西洋菜，菠菜，氯化鉀，鹽，菊苣根提取物，絲蘭提取..
避免動物缺糧，請預至少7工作天前訂購。Fromm 犬用 無穀物鴨兔肉蔬菜配方 (Hasen Duck) 4磅兔肉比一般肉類的蛋白質含量高，而其脂肪、熱量和膽固醇比例相對於其他肉類低。還包含有多種礦物質，如鐵、磷 、鉀、鋅和維他命 B 和 C等。其脂肪多為不飽和脂肪酸，除可増強健體之餘也有利於控制體重。另嚴選多種新鮮蔬菜 及水果，令營養更均衡。配方融合多種益生菌，針對改善消化系統，減低狗狗腸胃敏感不適，增強免疫能力。另加亞 麻籽及新鮮提煉的三文魚油，令配方含有奧米加3及奧米加6脂肪酸，有助寵物保持皮膚健康，滋潤披毛，亦有效提升 免疫系統，預防疾病。 *** 抗敏感首選 ***成份: 兔肉，鴨肉，豬肉粉，豌豆，馬鈴薯，小扁豆，鷹嘴豆，豌豆粉，幹番茄渣，幹的全蛋，肥豬肉，兔肉飯，豬肝，豌豆蛋白，三文魚油，奶酪，亞麻籽，苜蓿粉，胡蘿蔔，芹菜，生菜，西洋菜，菠菜，氯化鉀，鹽，菊苣根提取物，絲蘭提取物..